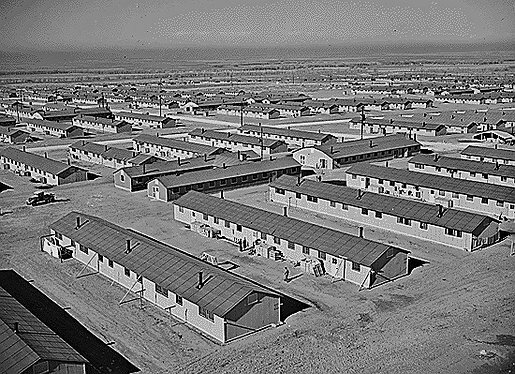 The Granada Relocation Center or Amache was one of the ten American concentration camps for Japanese Americans during World War II. The center was located 140 miles east of Pueblo, Colorado. It was opened in August 27, 1942 by the War Relocation Authority. Sixty two percent of the inmates were American Citizens. The following photos were downloaded from the National Archives. The photos were taken by War Relocation Authority (WRA) photographers who were constrained by WRA rules. The photos could not be sad or too happy. A sad photo would make the camp image suffer. A too happy photo would make the administrators look like coddlers. An example of images being too sad are photos taken by Dorothea Lange which were impounded by the Army. Lange was subsequently fired from her job. Ref. Dinitia Smith, NY Times, Nov. 2006, Photographs of an Episode That Lives in Infamy Retrieved March 17, 2011. For those who would like more details about these images, go to the National Archives website at https://catalog.archives.gov/advancedsearch. Type in "Granada Relocation Center" and hit search. RoyKakuda — 更新日 3月 27 2019 10:39 a.m.